Greece is one of the most popular resorts in Europe among kite and windsurfing lovers. A pleasant Mediterranean climate, the availability of wide sandy beaches and excellent wind conditions do their job. It’s also worth adding that it’s quite easy to find a school where you can master the beginner’s skills. Windsurfing in Greece is popular and has a long history. The first stations appeared almost 30 years ago. This sport is widespread on almost all Greek islands, but the most developed ones are Rhodes, Crete and Kos. The wind mostly blows from June to August, but in May and even in October its influence is still noticeable. In this matter, kitesurfing is not far behind. The island of Rhodes has long been a well-known name in the world of kiting. A big advantage is that extreme rest can be combined with beach and sightseeing. Let’s see where can you learn these kinds of extreme sports, and where to show your skills? This island is located only in 10 km from Rhodes. There is a Mistral surf center located just half a kilometer from the airport. It features two surf centers: the main one is situated in Gun Bay, and the second – in Afiartis. You can take lessons in both branches at once, since the distance between them is small. It should be noted that this place is especially good for beginners. This is because the constant and steady wind blows there, so you won’t waste your time waiting for the favorable weather for wind- or kitesurfing. In addition, this place is suitable for practicing turns and water start, as there are no waves in the lagoon, and you won’t break your knees. As for the boards, it’s best to rent it right in the club. Of course, you can also buy a special board for training. Situated 5 kilometers away from the island of Rhodes, Trianda city is the most popular spot among surfers. The reason is the availability of hotels for any taste and the right direction of the wind. In summer, the wind speed reaches 4-7 knots, starting from 2-3 in the morning and ending with the maximum value by noon. In Trianda, there are three centers beloved by sportsmen: Club Mistral, Surfer’s Paradise and F2 Pro Center. It’s difficult to distinguish the best one, since all of them are situated on a relatively flat coastline. Rhodes can rather be called a place for advanced windsurfers. It’s hard for beginners to surf there because of the lack of sandbars. Waves can reach up to a meter in height there. You will find a good place for surfing in the area called Prasonisi. This spot is absolutely not suitable for the fans of comfortable rest, but the wind is very strong and steady there. As the wind blows to the right, there will be quite normal surf on the right hand, and a smooth surface that will suit beginners on the left hand. Prasonisi offers two large surf-centers. As for windsurfing, it’s very popular on Kos. In recent years, it hasn’t been particularly popular among surf-riders, but now the situation has changed. Surf stations on this island have an excellent reputation, and some of them can boast of 20 years of experience. The best place on the island for windsurfing is Kefalos. 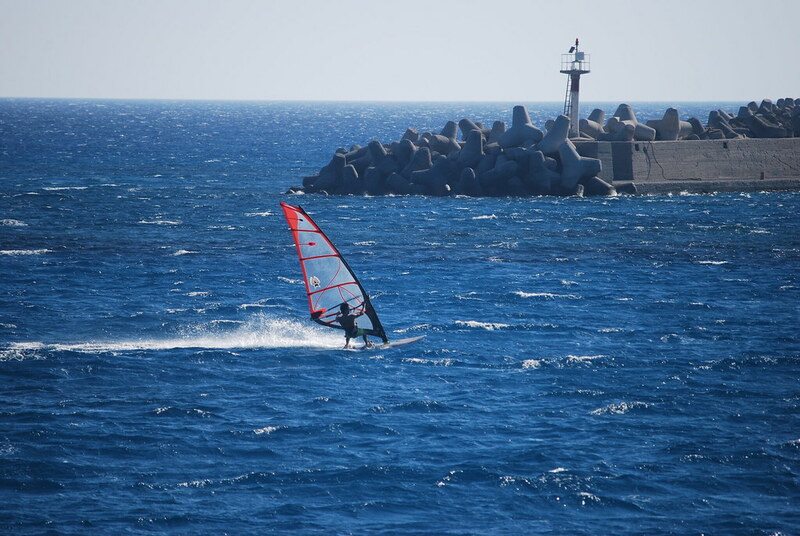 The windsurfing center is located right in the middle of Kamari beach stretching for several kilometers. The wind in the morning is more suitable for beginners, and after noon it becomes stronger providing perfect conditions for advanced surfers. As for kitesurfing, it’s not very common on Kos. Nevertheless, in Kefalos, as well as in Marmari special beaches are designed for kiting. There’s no smooth water in Marmari, since the wind blows to the shore. But this is an excellent condition for advanced kite surfers. Crete is the most popular Greek tourist destination among surfers. 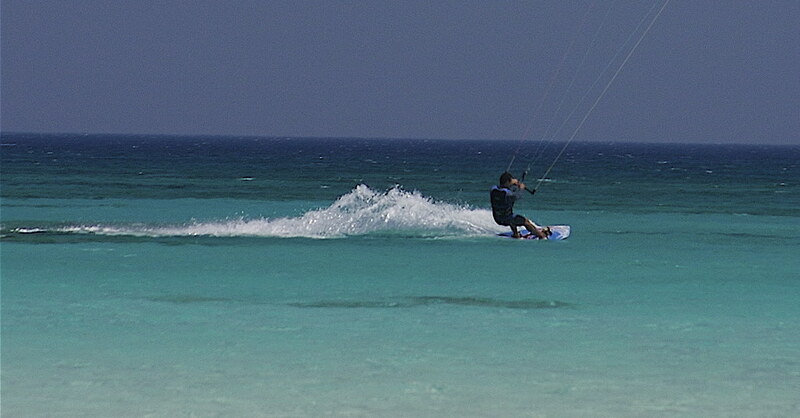 So, if you like windsurfing or kitesurfing, your journey to Crete will be unforgettable. The peak from July till August is the peak season for surfing, but the wind blows to the south all summer season. The most popular spots are situated in the northern part of the island. Several of them are located around Heraklion – the tourist center of Crete. If you want to surf in less crowded spots enjoying better wind conditions, then rent a car at Crete Heraklion Airport and set off to Palekastro region. It’s also ideal for beginners, as the water is incredibly smooth there. As for windsurfing schools, Windsurfingcrete and Freak Surf show a high level of professionalism. 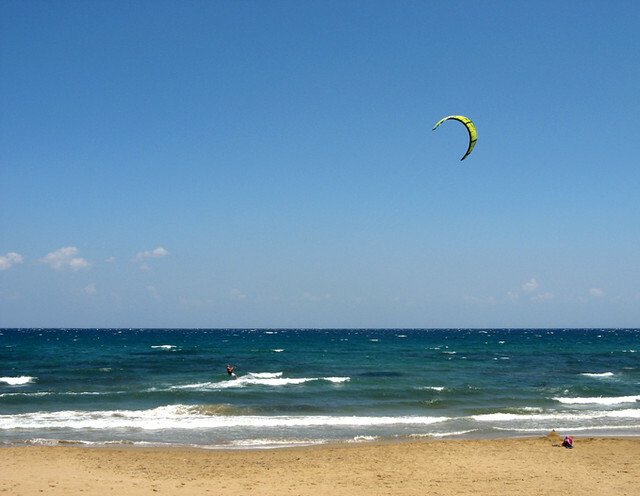 The most popular places for kitesurfing are Elafonisi and Palekastro region. Greece is the right destination in case you’re a fan of such watersports as wind- and kitesurfing. So, choose your favorite spot to try your skills on the next trip.